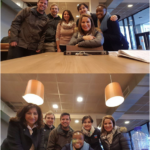 Today some of the TREES staff members from NWU in South Africa met with some of the staff at NHTV university in Breda, the Netherlands, to discuss the development and implementation of a quality label for dive operators. This meeting was very productive – we are looking forward to the end result! Tagged NHTV, NWU, Quality Label, TREES. Bookmark the permalink.